Hafner asked His Holiness for his impressions of Switzerland and he told her that like Tibet it is a mountainous country with pure, clean air, but is much more developed. He added that when he was in Tibet he mostly associated Switzerland with watches, particularly Rolex with its five-point crown symbol. Hafner mentioned 156 Tibetan children who were fostered by Swiss families, some of whom faced difficulties adjusting. His Holiness explained that in the early days in exile, many Tibetans had few possessions and were working building roads. An offer of help for Tibetan children seemed like an offer to preserve their lives. Referring to words attributed to him—sometimes we don’t reach the goal we aspire to, but other times reach something we didn’t expect—Hafner asked if that had happened to him. “Yes,” he replied, “as refugees we lost our country, but that has brought about other opportunities. If I had stayed in Tibet as it was, my life would have been much more restricted and isolated. Becoming refugees gave many Tibetans the opportunity to have a modern education. Meanwhile, we restored the training in the monastic institutions. As a result, in India we now have about 10,000 monks fully trained and able to teach, as well as a few thousand nuns. Overnight rain had left the sky overcast and there was a chill in the air as His Holiness set out for Winterthur. Arriving at the Eulachhalle he was able to walk directly from the car to the stage, stopping for the ‘chema changpu’ and to tease the dancers on the way. Once His Holiness was seated prayers were recited: a Long-Life Prayer, a Prayer for the Eight Auspicious Omens and so forth. The Rikon Abbot, Khenpo Thupten Legmon acknowledged the distinguished guests, His Holiness and representatives of the Zurich Canton Government among them. He explained how, under His Holiness’s compassionate guidance, he and the monks of the Tibet-Institute Rikon (TIR) have been trying to preserve Tibet’s religion and culture. He requested friends in the audience to continue their support for another 50 years. He also remarked that, in a year that the Central Tibetan Administration (CTA) has called ‘Thank You India Year’, he would like to thank the Swiss authorities for their consistent help and generosity. He ended with a prayer that His Holiness lives long and that the effect of his deeds may spread far and wide. President of TIR, Dr Karma Dolma Lobsang spoke next, expressing gratitude to His Holiness for attending the occasion. She recalled that when plans were in hand to build the Institute and the ground-breaking ceremony was about to take place, the Chinese embassy registered a protest, which the Swiss government took no notice of. She stated that since the number of Tibetans in Switzerland has increased, the functions of TIR have changed. With representatives of all four Tibetan Buddhist Traditions at the Institute, it functions like a bridge between communities. She introduced the first of two local politicians, Mayor of Winterthur, Michael Kunzle. After saluting His Holiness, Mayor Kunzle expressed the hope that TIR may be a place of peace and study for a further fifty years. He thanked His Holiness for his visit that has briefly put his town on the world map. The TIR fulfils a need and in its various teaching and study programs shows what can be done when you set your mind to it. Mario Fehr, Member of the Council of the Canton of Zurich and a long time friend of Tibet, announced that the Zurich government congratulated TIR on its 50th anniversary. “Jacques and Henri Kuhn set an example,” he went on, “they not only gave Tibetans work, they established a cultural centre that is a symbol of Tibetans’ integration into Swiss life. They have become our friends and neighbours; we belong to each other as fellow citizens. Dr Karma Dolma introduced a group of young Tibetans who were to perform a song, the lyrics of which were composed by Abbot Thupten Legmon. It was followed by a short video illustrating the foundation and development of the Institute. was admiring of the classes being held at TIR that focus on Tibetan religion and culture, of the fact that monks from all four major Tibetan Buddhist traditions are part of the fabric of TIR and that the library consists of 120,000 books. 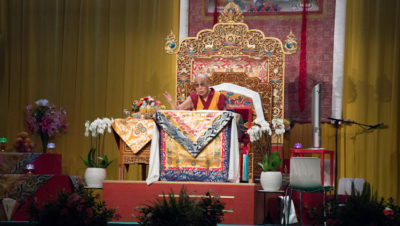 For the Tibetan Women’s Association, Switzerland, Mrs Pema Lamdark informed His Holiness and the audience that the Swiss TWA will be 30 years old in October. Among its various activities the association organizes prayers and offerings for the welfare of all beings at Rikon Monastery. On this occasion they offered statues of the Protectors of the Three Families, Avalokiteshvara, Manjushri and Vajrapani to His Holiness. Thomas Buchli, President of the Swiss-Tibetan Friendship Association, recalled that the association was founded 35 years ago and has become a strong participant in the Tibet support movement. He concluded his speech, “Bod-gyal-lo”. He was followed by President of the Tibetan Youth Association, Europe, Palden Tamnyen, who reported that his association is trying to increase interest among young people in Tibetan language, religion and culture. Performers of another Tibetan song were wearing costumes representing the three provinces of Tibet. A book entitled ‘Gifts for the Buddha’ that explores the symbolism of the wheel that in Buddhist tradition became the Wheel of Dharma, among the ‘Eight Symbols of Happiness’, compiled by Rudolph Högger and published by Tibet-Institute Rikon, was presented to His Holiness. “I welcome all the distinguished guests, reminding you that supporters of Tibet are supporters of the truth. I’m very happy to be here. I have a special connection with both Rikon Monastery and with Winterthur. I used to come here for medical treatment. “At a time when Tibetans’ only friends were the sky above and the earth below, we received help in the form of the Swiss Red Cross’s invitation to 1000 Tibetans to Switzerland. Later on, I remember there was a Swiss man called Ludi who joined Tibetans working in the fields when the settlements were being established at Bylakuppe. “Rikon Monastery was set up as a temple, but also as a place that could become a centre of learning, a place where people could study Buddhist philosophy. Geshe Ugyen Tseten, the first Abbot, laid a firm foundation for the future. “I respect all spiritual traditions. I don’t try to proselytise or propagate Buddhism in non-Buddhist countries, because I think it is generally better for people to stick with the religions they are born to. However, I also recognise that there are aspects of our tradition that deal with logic and psychology that may be of more general interest. “For a long time Indians explored methods for establishing peace of mind that arose from their efforts to achieve a focussed, calmly abiding mind and analysis of reality (shamatha & vipashyana). The Buddha left home, employed such methods and gained experience. He realized selflessness, overcame destructive emotions and their imprints, and attained enlightenment at Bodhgaya. He saw that clinging to an intrinsically existent self was a mistake. Prior to that there was a broad consensus in India supporting the existence of a permanent, single self. “The Buddha explained that just as a cart is designated on the basis of its assembled parts, so the self is designated on the basis of the aggregates, the body/mind combination. On Vulture’s Peak during the second turning of the wheel of dharma he gave the perfection of wisdom teachings. Many centuries later Shantarakshita brought these teachings to Tibet as the core of the Nalanda Tradition. Subsequently, for more than a thousand years, we have kept this tradition alive. “During dialogues with scholars and scientists over the last forty years or so, I have distinguished and set aside what is only of interest to Buddhists. I haven’t talked to them about enlightenment, nirvana, or future lives, but we have discussed how to achieve peace of mind in ordinary life. 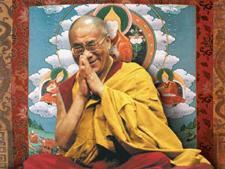 “The Tibetan spirit is firm because of our religion and culture. Even those who commit self-immolation, if they can carry that out, are capable of harming others and yet they restrain themselves from doing so because of their religion and culture. Young people in Tibet today have a strong, firm spirit. In the past committed Communists like Phuntsok Wangyal still maintained a strong Tibetan spirit. Tibetans have a passion to preserve their religion and culture. “There are Chinese today taking an interest in the Buddhism of Tibet. They say that Tibetan religion and culture will be the basis for a future reconciliation. “In 1959, I didn’t know if I would live to see another day. There were about 5000 monks to look after. We had to focus on how to keep our traditions alive. There were some among the Chinese then who asserted that all Tibetans could do was eat tsampa. As it turns out, we tsampa eaters have an intelligence comparable to that of Indian masters of the past. His Holiness mentioned that it was at Shantarakshita’s initiative that Tibetans translated Indian Buddhist literature into Tibetan, resulting in the more than 300 volumes of the Kangyur and Tengyur. In his ‘Clear Meaning’, Haribadra refers to practitioners who are sharp and those who are, relatively, dull. The Buddhist Tradition will only survive if those with sharp faculties study and practise. Dr Karma Dolma offered words of thanks. The TIR foundation offered His Holiness a Swiss watch. Tomorrow, he will teach from Nagarjuna’s ‘Precious Garland’, Kamalashila’s ‘Middle Volume of the Stages of Meditation’ and Thogme Sangpo’s ‘Thirty-seven Practices of Bodhisattvas’.